J/News Articles: Local J/24 Knowledge Pays Dividends in Mexico’s Yucatan! Local J/24 Knowledge Pays Dividends in Mexico’s Yucatan! (Progreso, Yucatan, Mexico)- “Until the 1950’s and 60’s when Yucatán was linked by rail and road, respectively, with the rest of Mexico, it traded by sea more with the USA, Cuba, Caribbean, and even Europe. It is home to one of the largest indigenous populations in Mexico, the Mayan people. Mérida is its capital city, and it is part of the Yucatán peninsula. This is all to say yes, Yucatán is part of Mexico, but it is a world unto its own. I made my way back to Yucatán Friday for my second year documenting (and sailing with) this enthusiastic new fleet which began just a few years ago, when El Capitan Jorge Ojeda convinced his friends to start racing one-design. They have captured my imagination for their casual determination to grow a fleet without scholastic programming or access to competitors. New to the fleet this year was Janko, a club boat named in memory of Jacobo Sosa, an active fleet member who died this spring. She was crewed by school-aged kids representing the youngest group of Yucatán sailors. The fleet is looking to add another club boat in 2019. Current J/24 US class president Chip Till flew in to lead a rules and tuning clinic preceding the regatta. In its second year, the format consists of a clinic on Saturday, a Christmas boat parade of lights, and the regatta on Sunday. With average December temperatures of 82°/ 69° F, it makes for a very good J/24 winter weekend. While Till stayed closer to the front of the pack and one of the fleets leaders Tomás Dutton, I sailed with the crew of X’kau (Mayan for blackbird), who kept yelling “perro” to my confusion as I connected the associated following action. They later explained they took this term from the Hobie class that once thrived there, who used it because a cam cleat “bites” like a dog. Applied linguistics will never stop being the most fun part of intercultural sailing to me. When he wasn’t expertly trimming, Till had fun with it, too. My other favorite part outside of the sailing is the food. Homemade horchata is one of the million gastronomic perks of Yucatan casual dining. No better way to put back a fresh cochinita roll for a pre-regatta breakfast of champions. I also ate grasshopper doused in hot sauce and lime from a beach vendor bought by one of our hosts- Ignacio “Nacho” Ponce Manzanilla, the man behind Yucatán’s yachting growth, although Nacho said grasshopper wasn’t local. On a weekend with shifty, often low, and challenging winds, it was great to enjoy the delicious local cuisine. Sailing took place off Progreso, a port originally planned for fishing and tourism and now the largest exporter of octopus and scaled fish in Mexico. As a result, the J/24 Yucatán class is geographically isolated from the nation’s only other J/24 fleet, the established and skilled sailors in Valle de Bravo. 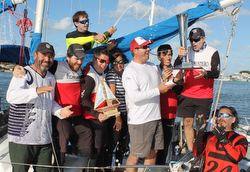 The J/24 sailors of Yucatán could just as easily reach Miami to compete, which is to say they can’t reach either place easily. This creates national level friction as they work to create competitive opportunities outside themselves. J/24 Yucatán cannot easily come to its competitors, but urge its competitors to come enjoy racing in Yucatán. After 25 years of a yacht club with no facility, Club de Yates de Yucatán has a home a block from the beach now, surrounded by marinas, and is at work to secure a hoist and ideal water access. The world’s longest pier creates an artificial harbor for their course, buffering prevailing northeast winds to create year round ideal conditions. That’s not to say it never blows from the northwest. Once a month or so, including this weekend for the final in the annual Regata de Amigos series, a “chikinic” (Mayan for “northwestern wind”) blows in and challenges the sailors on the race course. J/24 Yucatán are organizing a team for 2019 Charleston Race Week, and planning other efforts to connect with the international J/24 community. Proof that being isolated does not have to mean being alone.” Thanks for contribution from SailingAnarchy.com- Anarchist Heather. Learn more about J/24 Yucatan here Add to Flipboard Magazine.